We are a team of highly qualified physicians, advisors, coaches, trainers, professors and university instructors. Use our knowledge from science and research – we will help you transfer it profitably to your everyday personal and business life. As a special offer for corporate customers, we provide training, one-on-one and corporate coaching as well as advising in all questions relating to health management. Here, foremost the custom fit and the sustainable effectiveness are the top priorities of our services. As a long-term partner, we would like to support you in expanding health-promoting measures and establishing them at your company. To private customers, we offer medical vitality diagnostics at our medical practice in Munich Neuhausen, as well as one-on-one effectiveness and stress management coaching. 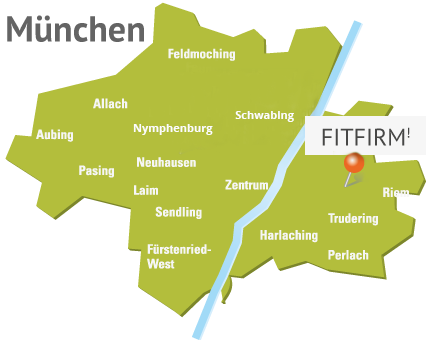 FITFIRM GmbH offers innovative and professional stress management for you to preserve and increase your performance and your well-being. Our motivation is to strengthen your vitality and performance. We are thrilled when we support individuals and companies in strengthening their vitality and performance. Therefore, we see ourselves as a partner for private and corporate customers – starting from diagnostics to recommending effective methods and leading up to their implementation. Particularly the direct applicability of the solutions in our customers' professional and private context is important to us. We work with a professional and interdisciplinary team. We are a team composed of trainers, coaches and physicians who apply the latest insights from professional sports, medicine, neuro sciences and psychology on the one hand and centuries' old Far Eastern knowledge on the other hand. The responsibility for our customers inspires us to always give our best and continuously further our education. Additional titles of "Doctor of Naturopathy", "Doctor of Anti-Aging Medicine GSAAM" and "Medical Quality Management"
Stress can have fatal consequences for our body and mind. The ROME® System cancels out the negative effects of stress. The authors describe how anyone can return in easy 4 x 4 steps to better well-being and top performance: (1) through relaxation exercises, (2) better organisation, (3) change of one's own attitude, and (4) a healthier lifestyle. In 4x4 steps to improved well-being & performance including an audio workshop. In order to determine how resilient you are to stress, you can use the scientifically validated ROME® questionnaire developed by FITFIRM. The analysis of the ROME® questionnaire provides you an overview of your existing skills to avoid and reduce stress. At the same time, initial important modes of behaviour become evident from your ROME® results. These insights help in the further step to discuss concrete aims to handle your job and everyday life more successfully in terms of stress and performance pressure. For 90.00 Euros you will receive a detailed analysis from our stress experts. (Should you already have received an access code, you can scroll directly to the bottom of this page). As soon as the amount was received, we will send you the link and access code, to the ROME® questionnaire. The results will be sent to you by email. Subsequently, personal coaching can be scheduled with our experts. Take an online test to evaluate your resilience against stress and profit from a detailed analysis. Since 10 years FITFIRM support people in a healthy, happy and successful life. This is mediated in inspiring seminars, lectures, coaching and medical check-ups. We use this professional techniques from science and cooperate with experts from the health sector. In the coming years, we will support you as a strong partner to help! We look forward and to express our thanks to all those who have given us over the years and also coached their trust!